Martin Grelle's paintbrush and canvas, rather than a pen and paper, create his stories of the Native Americans. This image is a masterwork by the incomparable Grelle. 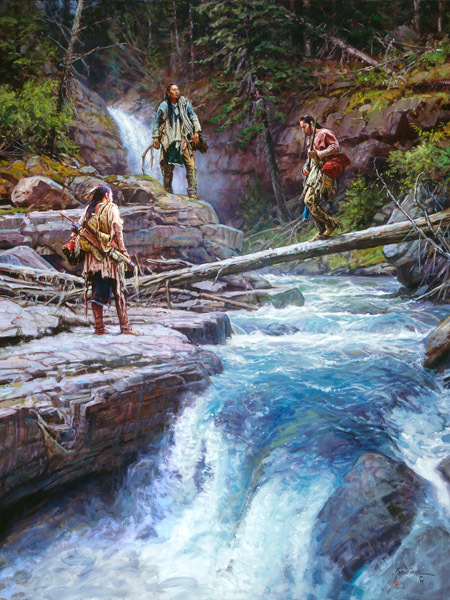 With a waterfall rushing down the rocky landscape, the braves created a foot bridge from a log to cross the cold water to continue on their journey. Crossing this icy water makes their journey one in which man must overcome nature to navigate the terrain.